Commissioned by the Design Museum, Poke developed an animated map charting the history of digital design in London. 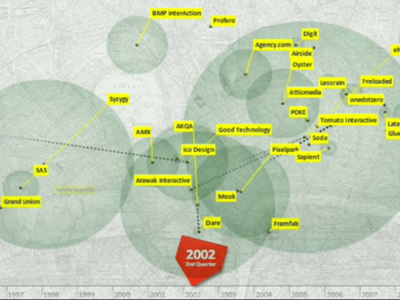 It maps the growth, death and merging of main design agencies in the city of London from 1994 to 2009. 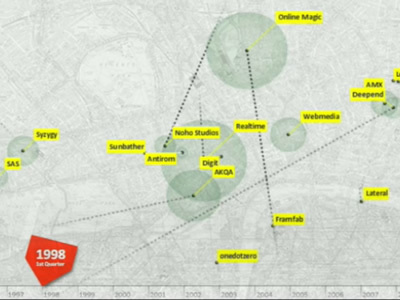 As Poke explains: "The digital design industry is the very epitome of rapid change, so we decided to make an interactive, time-based map. This allowed us to demonstrate that speed, as well as show off the advantages of a digital approach. The creation of a map also meant we could chronicle the geographical movement across the capital, triggered by a high rate of agency mergers, acquisitions and deaths, in a visually commanding way."